Topp sixpence, som egentlig peker mot en femmer. Ga den 4 - synes den er såpass bra at den skulle vært i 100% ull! Jeg fikk det jeg ble lovt, til lovt tid! Trekket inni sixpencen er råtøff ! Hatten passet for å si det sånn ! Finner ingen negative kommentarer, er fornøyd og får mye ros for kjøpet. Sixpence hatter, som stammer helt tilbake fra 1900-tallets England, har alltid uttrykt en avslappet stil. De fleste av våre modeller fås i to størrelser, og er laget i en variasjon av materialer. Den originale sixpencen er av bomull. What is a Flat Cap? In its basic form, the body of the cap is pulled forward over the brim and is sewn or snapped to the top edge of the brim. Flat caps are recognisable by their triangular profile. The newsboy cap or newsie cap is similar to the traditional flat cap but with a fuller, rounder body and a button on top. This is only one type of flat cap. Depending on where you live, you may have heard one of its many other names: Joao’s hat, sixpence, cabbie, paddy, Gatsby, longshoreman’s cap, scally, Wigens cap, ivy, derby hat, Jeff cap, duffer cap, duckbill, driving cap, bicycle cap, Irish cap, crook cap, bunnet, cheese-cutter, or a paperboy flat cap. We’ll stick to flat cap. 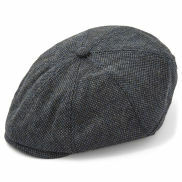 The flat cap, as modernly stylish as it may be, has been around for ages. In the 1570s, the British government tried to increase wool consumption by requiring all non-noble men (that would be us) to wear a wool hat on holidays and Sundays. The law was short-lived, but the flat cap became a part of the working man's uniform. Its popularity boomed in the 1910s and 20s in the USA and UK. 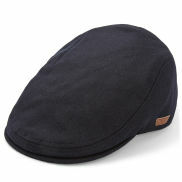 Celebrities in the 90s gave the flat cap a revival as well… but we suggest sticking to the British past for inspiration. Natural materials offer better insulation and breathability. Stick to wool, cotton or linen. Consider the originals – tweed, cotton or wool – before loud multi-pattern caps or super trendy ones that will go out of style. Round the brim to frame your face by applying gentle pressure to the flat brim. 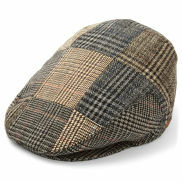 Wear your flat cap the correct, original way – not backwards in 90s style or unpinned or unsnapped. Flat caps are perfect for spring and autumn. In the winter, your head deserves something warmer like a wool beanie. In summer, a Panama hat is cooler. Avoid pairing a flat cap with other old-timey accessories... unless you’re auditioning for the Broadway revival of Newsies. The hatband and the brim create the structure of the hat and should fit comfortably across your forehead similar to a snapback or baseball cap. When sized correctly, flat caps have the unique ability to flatter most face shapes. Use a tape measure or piece of string. Hold the string or tape measure firmly around your head about 0.5 cm above your ear. Circle it around your head across the middle of your forehead. Take note of the measurement.